No chocolate? Crunches in the evening? My world is being turned upside down. I’m not sure exactly how it happened, but it’s been 13 days since my tongue last tasted the dreaminess of chocolate, sunk down into its delectable milkiness, and slowly rolled it from cheek to cheek just as a sommelier would minus the spitting out. 13 days!!! Wha-at? I am a chocoholic. My addiction is so extreme, once on a Lufthansa flight to Florence, when I discovered a box of sample Ritter Sport chocolates (hazelnut-raisin, le sigh!) near the washrooms, I seriously went to the washroom every five minutes stuffing my pockets and fists full of chocolates! And then there’s my drawer o chocolate at work stuffed full of Swiss chocolate, Belgian chocolate, French chocolate, German chocolate, chocolate chocolate, chocolate. (Only the best of course!) Recently, I spent more than $20 to restock it. That drawer started out as an emergency pick-me-up drawer to get me through the odd afternoon lull, but soon, my hand was reaching down into it before lunch, and as early as 9 a.m.! And when you have your allotted one strip of chocolate at 9 a.m., you’re pretty much thinking about having another strip the entire rest of the day before finally caving in and having a second … sometimes even a third. I could always justify it, though. Somewhere in the world it was noon, I’d tell myself. Or, this piece will be my last piece. It was never my last piece. So, I challenged myself. I figured if it takes three days to break a habit, let’s give it a whirl, see if I could break my chocolate-loving habit. I’m 13 days in, and the days of getting by without my love are getting somewhat easier, although, I do still think of her at least once or twice a day. So, let me be clear on one thing here, this is only a challenge, and a challenge is NOT forever. Me and my chocolate will NOT permanently be separated. 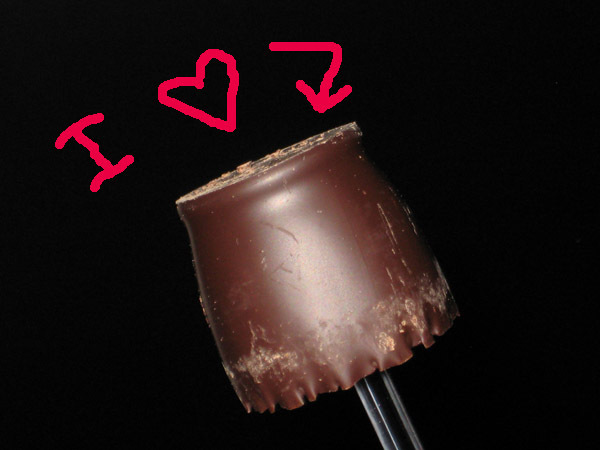 I am a chocoholic and I am proud. 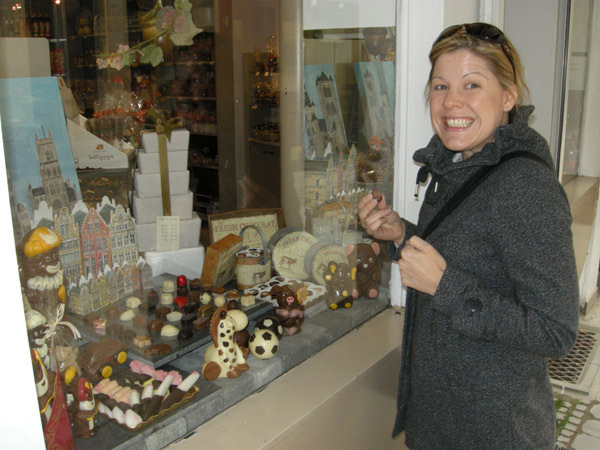 Ghent, a chocoholic’s dream come true! A chocoholic’s nose with always smell out free chocolate samples! Salted chocolate, love at first bite! At the same time as breaking one habit, I’m also trying to start a new one. For a good month and a half now, I’ve been trying to convince myself to do some of my pilates ab crunches at home, but I always managed to come up with an excuse as to why I couldn’t do them … once, I even physically got down on the ground to do a hundred, and before I was able to lift my arms and legs into position, I was already standing back up again moving on to something a whole heck of a lot more fun. Not anymore (so far). Tuesday night, before hopping on the trainer, I laid down on the ground and did my crunches, not many, just a variety of about 68. Wednesday, after my run, I did them again. Add Monday’s pilates and tonight’s pilates and that’s FOUR WHOLE DAYS OF ABS! Not sure how long it’s going to last, especially with the weekend fast approaching, but if the same rules apply to starting a habit as they do to breaking one, I just need one more day to get through on my own, and my abs will be on their way to becoming super core! How have you challenged yourself lately? 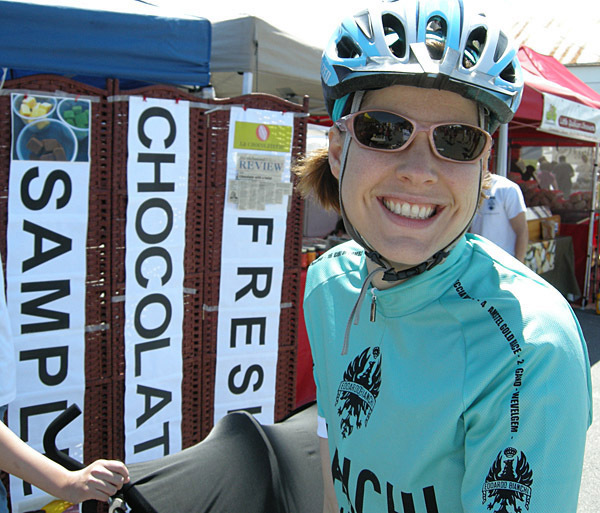 This entry was posted in Training and tagged abdominals, breaking a habit, chocoholic, chocolate, Ghent, Pilates. Bookmark the permalink. HELLO solid chocolate sistah! I have an addiction too. 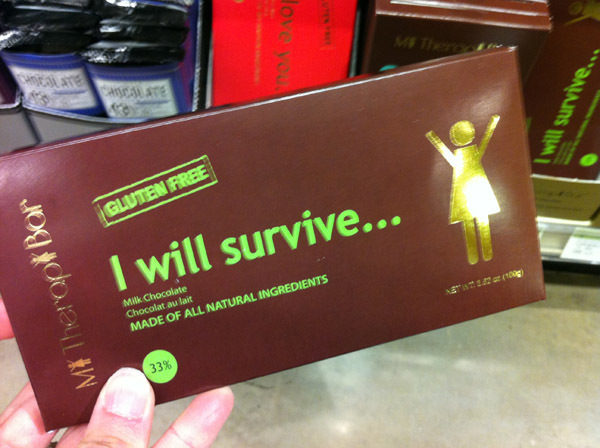 Only solid milk chocolate will suffice. I tried quitting before many many times but as soon as I try a bit of chocolate again, it’s all over! I don’t keep it at work or in my bag any more. Right now actually there isn’t even any in my house GASP!!! this is rare. and I have been going NUTS!!! For me, I’m like the smoker who is perpetually quitting. A week here, a few days there…. Do they make a “patch” for chocoholics? I’m so doomed. let me know… if you find a way to have it in moderation because I can’t! Good Luck! I will not be joining you on this crazy challenge. Chocolate and I are inseparable and WE love it that way..
Well, now I know what to get you if I’m ever bringing a present! I’d just like you to know that since I commented on this post this morning I went out at lunch and bought some fancy chocolate. You reminded me that I haven’t had any in awhile (and I’ve had a really bad week). It’s funny, you write about quitting and all it made me want to do is binge! Katie, you might want to plan your next marathon in Fernie, BC. I just heard a CBC North By Northwest interview with the owner of the “Beanpod Chocolate Restaurant and Store” and it sounds like a place you might want to visit.